Here is 18 inches. Six days ago, it was 60 degrees in this very spot. Snow’s pretty, but right now, when we are about to spring forward? Pretty disheartening. It will be gone soon and you’ll have a lake in your yard..fun@! 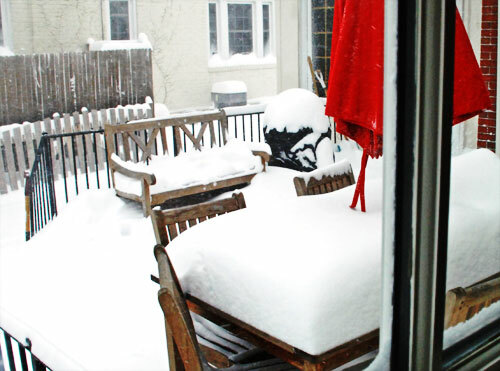 If that weren’t snow, it would be one humdinger of a sheet cake on that table! What a storm! I am sooo sick and tired of snow! Same thing here, a Spring teaser, and then snowstorms. I guess thats just March. That’s’ just wrong. But, I can’t help laughing. I have a sunburn from the AZ sun. The weather has been so unpredictable everywhere in the country tis winter.